Before the membrane concentration phases of the novel process for treating landfill leachates proposed in RELACH, the biologically pre-treated leachate obtained from the SBR, needs to be clarified in the last step of leachate pre-treatment. This clarification stage has been approached from two different techniques: sand filtration and ultrafiltration. Sand filters can provide removal of suspended solids and turbidity as well as microorganisms. The column sand filter has been assayed in both monolayer and bilayer configurations. Must be recognized that sand filters have their limitations and the technique showed poor capacity of reducing solids and turbidity of biologically treated leachate. Ultrafiltration (UF), which is a pressure-driven membrane process, enables the colloidal particles, emulsion and microorganisms to be removed. Ultrafiltration showed a substantial decrease in suspended solids and turbidity of biologically treated leachate. 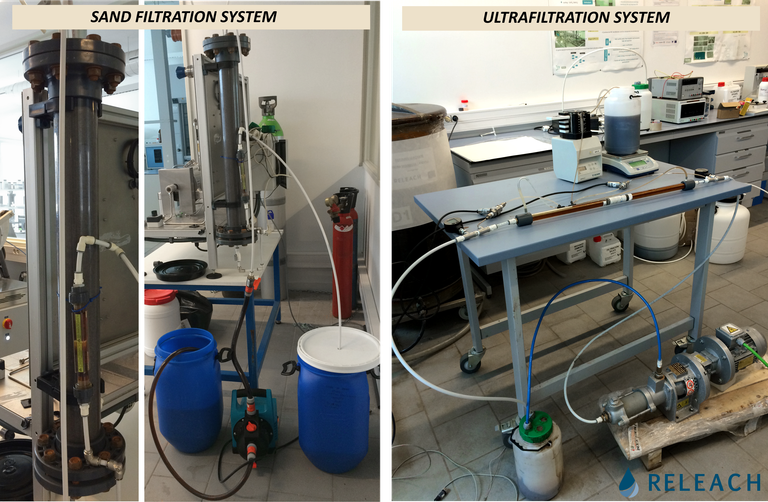 As a conclusion, the ultrafiltration process reduced the turbidity to less than 1 NTU, which is perfectly suitable for next filtration steps.